I will do a full write up soon but a quick word of advice in the interim. Do not use any of the tuning guidance above for universal tuning version of emission side drafts (DHLA40F,G, H etc,)that have independent idle/progression and main systems. Bigger idle jets and E tubes designed specifically to work with, and control, the interconnected idle / progression systems are the go. Some 40mm Dellorto DHLA carburettors are of a homogenous design with the idle/progression circuit fed fuel from the main circuit chamber instead of directly from the float chamber as in open/universal tuning models (DHLA40, 40E 40C). These are referred to as “emission” models but that is probably inaccurate. It is probably more accurate to describe them as road car models as the design is more about improving the road manners of a carby primarily designed for motorsport. For information on how to tune “emission” DHLA models I suggest a visit to the following website. My understanding is that ”emission” models have more progression holes so they flow more mixture more evenly in the progression stage. The progression mixture is leaner but there is more of it flowing. They have a big fixed air bleed (2.0 to 2.2mm) to support the flow and big idle jets (60 to 65) to compensate for the increased air bleed. Unlike open tuning version the span of the progression stage is not separately tuneable by selection of idle air bleed. Progression duration is controlled by the initiation of the main circuit starving the idle circuit. For the main circuit to do this job properly it has to have “emission” specific e tube. The progression stage of an “emission” DHLA may be longer and use smaller auxiliary venturis fitted to keep the main circuit coming on too strong too quick. If you use idle jets sized for open tuning models the progression will run too lean. If you use non emission e-tubes the progression won’t be controlled properly and the mains won’t come in at the right time. 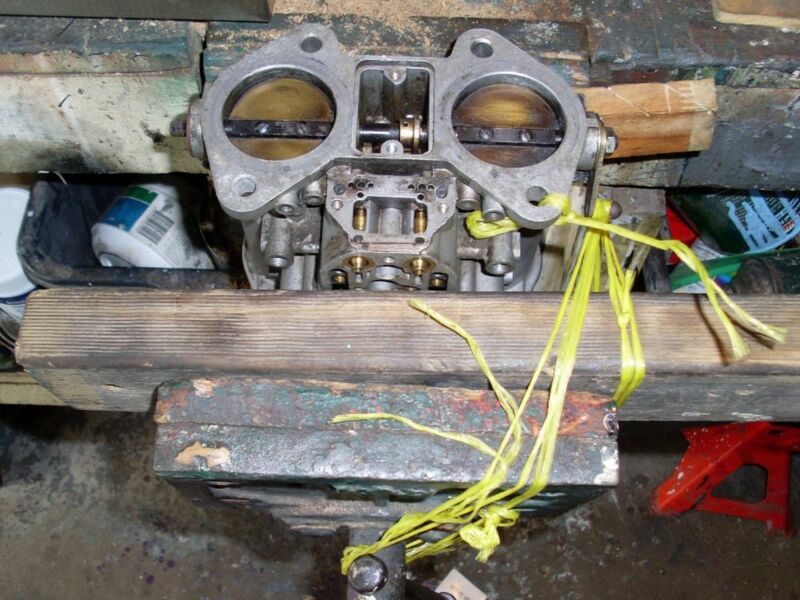 Hamill suggests that “emission” DHLA 40mm work best on engines 450cc per cylinder upwards. None of the 45 DHLA are emission models. The DHLA 45C looks like an “emission” model but isn’t. DCOE emission models – have yet to figure out. I have been living with an OK but less than perfect idle for a couple of years. Replaced the hose to the brake booster and now have a perfect idle. Visually the hose looked fine but it was as hard as rock and obviously did not seal properly. Even cutting 20 mm off each end and refitting did not work. 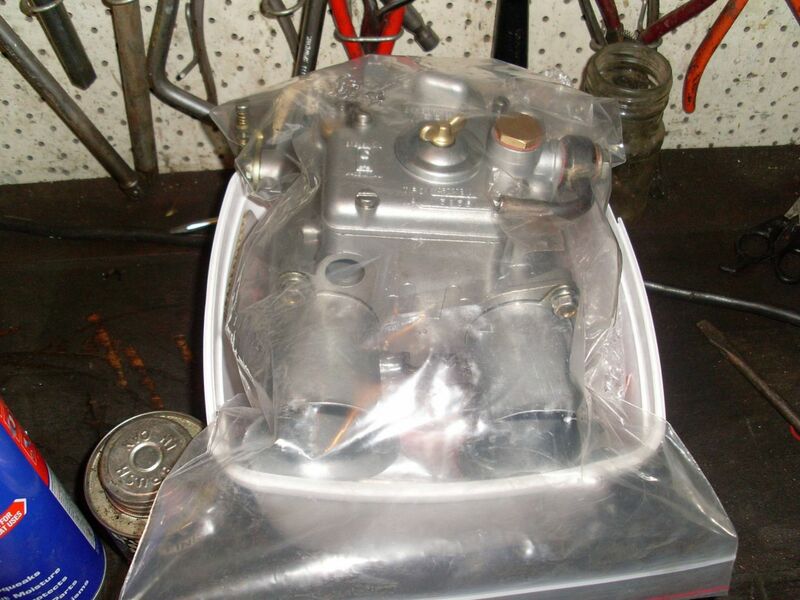 If you buy a side draft carburettor off ebay or gum tree or enthusiasts website in 9 cases out of 10 the carby will have a problem that will prevent it from running out of the box. In my case that statistic is 17 out of 17 as I have never managed to get one fit to use from the get go. People sell side drafts out of frustration or because something is broken or missing. In advertising speak, “Was running on car “ translate to "running so rough I could not stand it” and “professionally tuned” translate to “I have a mate with set of jet drills”. Ebay is a place where lemons are passed from hand to hand and each hand inflicts some further molestation. Not all bad news as long as you bid with the knowledge that further expense will be likely and know how to diagnose and fix the problems that have frustrated previous owners. And that is what this new section is about – profiting from previous owners lack of knowledge and skill. 	Jet drilling day at the local kindergarten – needs no further explanation. 	Surprise! No jets fitted under the cover. This simplest part of a side draft can often cause the most frustration. First check is that the throttle plates completely cover the first progression hole with the idle stop fully wound out to recommended setting (half turn to a turn). Some throttle plates have sweeps / flutes cut in them and some don’t depending on the location the first progression hole is drilled. If the butterflys have been previously molested the wrong plates can be fitted as in the photo below. 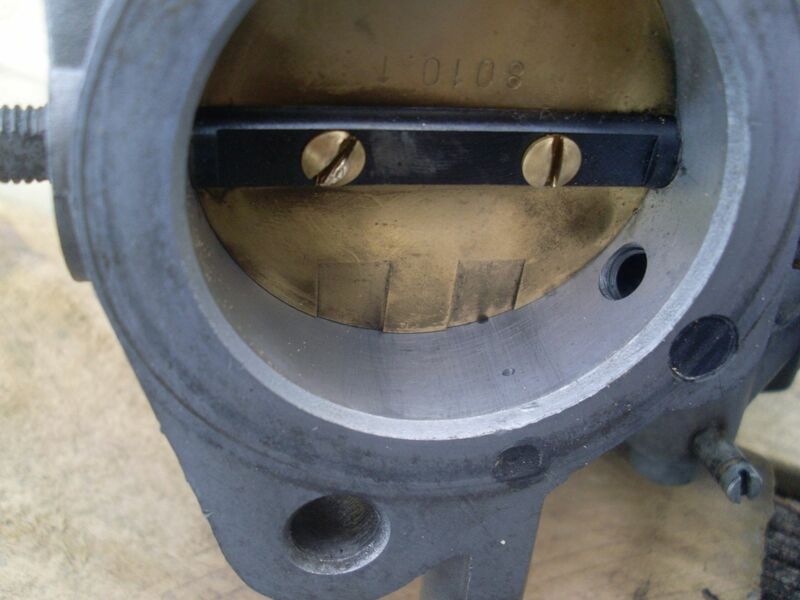 Misalignment of the throttle plates can also stop the throttle fully closing and progression hole being partly exposed – 1 mm loss of plate closure can be the difference between smooth and rough idle. To check alignment of plates hold up to light and look through the air cleaner end (chokes removed) and idle screw wound out. There should be the narrow crescent of light showing evenly around the rim of the throttle plate of possibly no light at all in a perfect fit (rare). If there is uneven or large light spillage then there is probably an alignment issue. 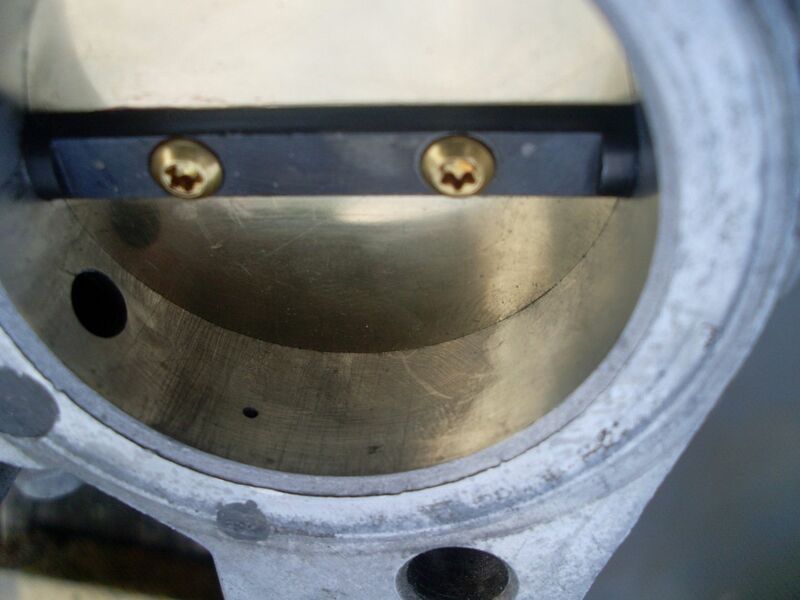 Misalignment of throttle plates can cause binding of the plate and throat close to the spindle which increases as the throttle approaches the closed position. Look also for rub marks on the throat above and below the spindle shaft entry holes. A factory set carby can be out of alignment if the spindle shaft is knocked while the nuts and washers on the ends are loose of missing. It only takes a small movement of the shaft or bearing in its seat to cause binding because the tolerances are so fine. Taping the bearing to reseat it and securing shaft ends with nuts washers and linkages in place may fix the problem by pulling things into alignment again. If the throttle plates still bind the gap around the plate is uneven then the plates can be reset. 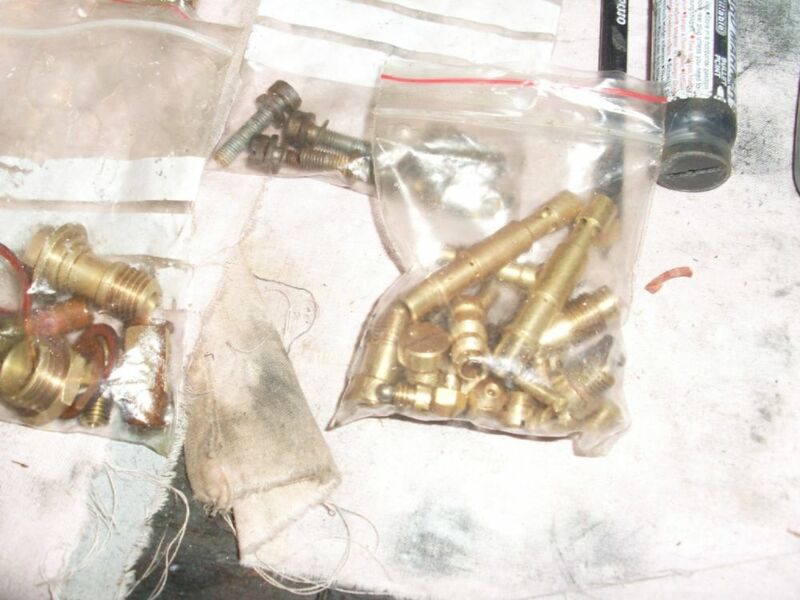 The resetting process involves removing and replacing the brass or steel screws securing the plates to the shaft. 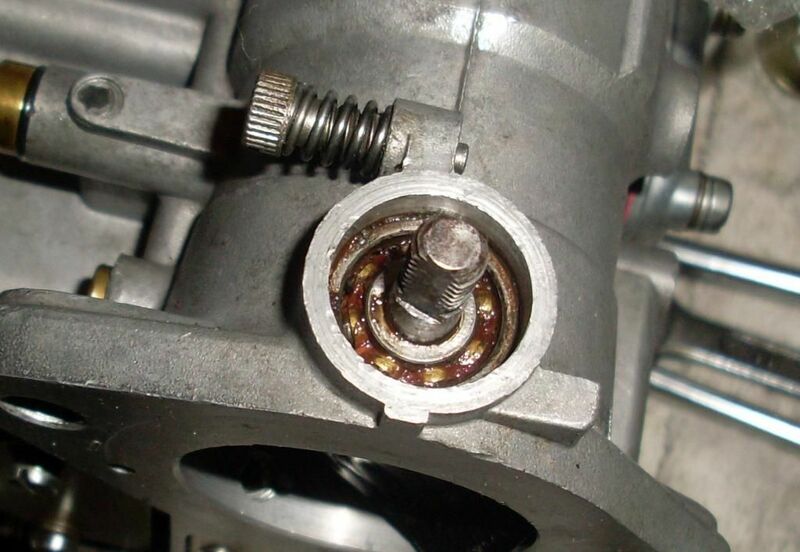 Note that you need to grind the piened end off the screws before removing or the shaft thread will be wrecked (except Mikuni Solex which don’t have peened screws). Not a good binding job but you get the idea. Carby has to be secured to allow sufficient downward pressure, at the right angle, to be applied to the screw to loosen. More tips in shaft and butterfly maintenance to follow. Sticky shafts can also occur through dry or corroded shaft bearings. Both the weber and dellorto shaft bearings can be cleaned with petrol and re lubricated. If the bearings still move like a Sidchrome ratchet after relube they will need to be replaced. Refer to Hamill’s book for the process for removing shafts and bearings. In the majority of cases the bearing can be saved as the roughness is caused by lumps of dry grease. These grease lumps can be stubborn to remove. 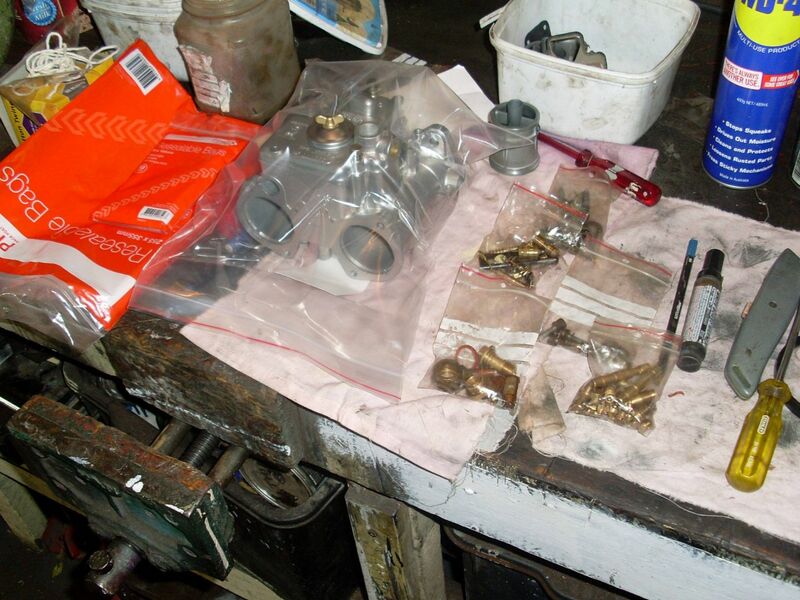 If you read all the manuals for refurbishing carburettors they will stress the importance of having a separate clean environment for re assembly of carburrettors - yeah like as if. You would be lucky to find anywhere on my work bench free of wood shavings of iron filing and general grot. Like it's a man- shed after all. My solution to keep nasties out of refurbished carby bits is resealable plastic bags. I have used bags to put the dirty bits in as I pull it apart and transfer to clean bags when the components are cleaned. This system also helps organise parts into groups and reduces the chance of losing stuff. If you put parts in a tray you are inviting it to be knocked over - no fun searching the garage floor for a check ball.